The ability for your participants to receive email messages from the echospan.com domain is a critical component of your review process. Prior to launching your first project you should be sure to ask your IT Email department to whitelist the echospan.com email domain. During testing, you can confirm if your test participants are receiving email as expected. If a participant reports issues receiving email we recommend working through the steps below with them to resolve the issue. Double check the email of the user in the system. To do so, login to your project, from the drop-down menu, select Raters >> Manage, find the user in question and click on their name to view the email address assigned to them. Have your users check their email spam folders. 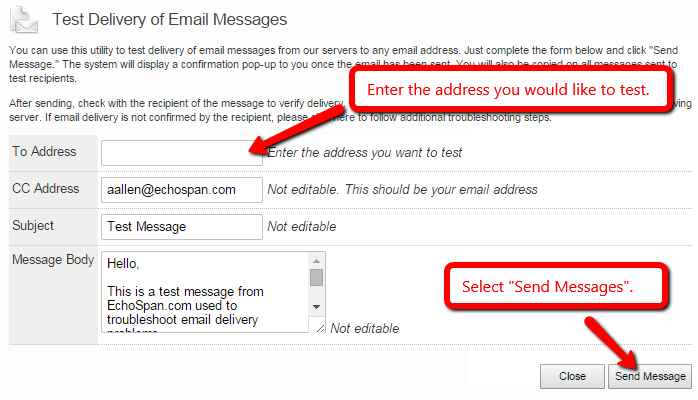 Use the Email >> Test Email Delivery utility found in the EchoSpan administrative tool. This tool lets you send test messages to recipients within your company. If the utility confirms sending the message and your user doesn't receive it, it is likely that it is going to a spam folder, or being caught by a mail filter. Check with your internal email admin and ask them to make sure the echospan.com domain is whitelisted. If it is not they may also need to release any past email stuck in a filter from the echospan.com domain.